Orchestrating a 4-2 demolition of Barcelona in front of 55,000 adoring fans would, for some footballers, be the very pinnacle of their career. 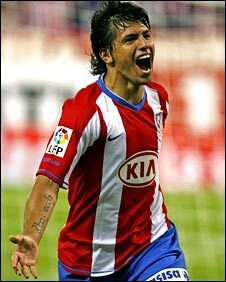 But for ambitious young striker Sergio Aguero, who is only 19, it is highly likely the two goals and two assists he delivered in Atletico Madrid's devastating March victory over the Catalan giants are merely a vivid flashpoint in the early days of a long and successful career. But a lot of hard work lies ahead if he is to achieve that goal. Here 'El Kun' gives BBC Sport the answers to your searching questions on his life as one of the hottest properties in world football. What are your pre-match rituals? I suppose my pre-match ritual would include rubbing my hands together while walking up the stairs on to the pitch. I also try not to focus on the match in order to stay relaxed. I ensure to get plenty of sleep before the game. And I like to hang around with friends, listen to music, and prepare myself mentally. Would you say being smaller than the average player assists or detracts from your game? Do you have any advice for other young players who are blessed with height? Talent is not measured in centimetres nor in kilograms. Personally, my size is neither an advantage nor a handicap. It doesn't affect the way I play by any means. Skill is much more important than size. And what's wonderful about football is that the smallest player can compete and win against the tallest player. For instance, during the Under-20 World Cup in Canada this year, my team-mate Maxi (Maximiliano Moralez) and I were the smallest players in the entire tournament and yet we still managed to win the championship title. I even received the Golden Boy and Golden Boot award in this tournament. I do think that muscle is important though, for you need muscle to be competitive and stronger. As for advice... Height is not a disadvantage to a person's game - skill is what really matters. It's all mental. If you're small and you think you have a disadvantage because of your size, then you'll probably lose. But if you're small and you play like a champion or a giant, then you'll win battles. Do you think that it helps that you, really, are part of the first generation of Argentine footballers who hasn't grown up during the career of Diego Maradona? 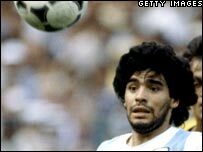 Growing up watching Maradona videos and hearing everyone talk about him definitely had a great influence on me. 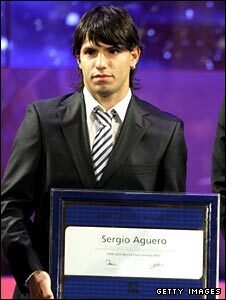 In Argentina, he is an icon to millions who hope to one day become a professional footballer. But I think that great footballers who represent a role model to the youth have always existed, I just happened to be fortunate enough to watch one of the better ones while growing up. It wasn't that he gave me any particular help but his enthusiasm rubbed off on me. I don't think there is pressure on young footballers to live up to his reputation but I do think that he ploughed the way for future Argentine players. He made a great difference. Every team that he played for - in Argentina, in Spain, wherever - he was the best player on the team. And even though he set a high standard for later generations, Argentina produces a great amount of world-class players every year. All these players have their own unique talent. What tactic or skill do you think is most responsible for your success so far? I'm very young and so I still have a lot to learn and improve on but, as far as tactics are concerned, I like to begin with some space before entering the box so I can take advantage of my speed. I like to stay in the area and rotate because then it causes the defenders to guard me from behind. Above all, I like to entertain people when I'm playing. That gives me incentive to be creative. Overall, speed is very important, for players are a lot quicker here in Spain than in Argentina and the defence is a lot stronger. So that causes me to move around more in order to find an opening or some space. Usually, when one-on-one, I like to take the defender though. Given the nature of the La Liga this year, do you feel Atletico have missed out on a chance to compete for the title? We played well in the first leg of the season and when 2008 began we had the opportunity to fight for the title - but we lost various games and didn't achieve our objective. But it's important to remember that teams like Real and Barca are well established, especially in terms of their squad. Many of the players have a lot of experience playing together and so this season is merely advancing their unity and coordination as a squad. They are already familiar with one another. In addition, the objective that we had originally made in the beginning of the season was to compete in the Champions League. And so far we've maintained a fourth-place position. There were a lot of new players on the team and I think it took a bit of time until everyone was used to playing with each other. Players came from different teams, leagues, and countries, and so many of them had a different style of training and playing. But our team has grown tremendously this past season, I am confident that we will qualify for the Champions League and, hopefully, next year compete for the Spanish League title. You are one of the most exciting players that I have seen for a long time and I expect over the coming years you to be recognised as one of the top three players in the world. What drives you as a player? What is your motivation? My motivation in life stems from my family, friends and fans who have constantly supported my decisions regardless. My father Leonel and mother Adriana have given me their support and have helped me a great deal and still to this day I can always count on them. I owe them everything because they went through a lot in order for me to be here today. Also, the motivation from the red and white fans has helped me a great deal with my move to the Spanish League. These individuals are the reason why the team is fighting so hard for a position in the Champions League. We want to satisfy our fans who have waited so long for a victory. In terms of Romario and Maradona, I think it's important to remember that these individuals are among the top players in football history. They were both unique in their own way and neither of them could ever be replaced by any footballer in the present nor future. It's an honour to be compared to either of these players. A good player is a good player regardless of their nationality or ethnicity. People say that I remind them of Romario because I have the mentality of a striker and the body of a midfielder. But I feel fortunate to even have my name mentioned amongst either of these great players, be it Maradona or Romario. Each player is distinct and could never be replaced, only compared. I hope that I can make a difference in the football world like Maradona or Romario. I want to conquer and achieve great things both for Atletico de Madrid and the Argentina. I hope to be able to make my own mark in history. You have a tattoo written in Elvish script on your forearm (which looks very good by the way! ), could you please tell us what the English translation of your tattoo is? Thanks. The tattoo reads 'Kun Aguero' on my right forearm in Elvish script. A number of other players that have a similar tattoo, including Fernando Torres, Maniche, and Antonio Lopez. It's a popular one. If there was one rule you could change about football what would it be? I don't think football currently needs to excessively change its rules. I do, however, believe that players should be protected. Fair play is always a big issue in football, especially in terms of injury, and it's important to protect the talent and quality of players and make sure they don't get injured. Football is meant to be a physical game but a line has to be drawn somewhere. I guess if I were to change one rule it would be an extra referee on the pitch. I've heard that referees run around eight miles per game. That's equivalent to some of us players! Another referee on each side of the centre line would help in terms of distinguishing fouls and offsides. There is a lot of pressure on referees and an additional arbitrator would avoid discrepancies and help distinguish calls.